How do you Measure Employee Behaviours Against Your Company Values? How do you know when you interview someone for a job that they will live up to your Company Values? How do you measure employee behaviours against your Company Values? The first and the third have a brief description of what each of them means. The second one is a straightforward list of words. 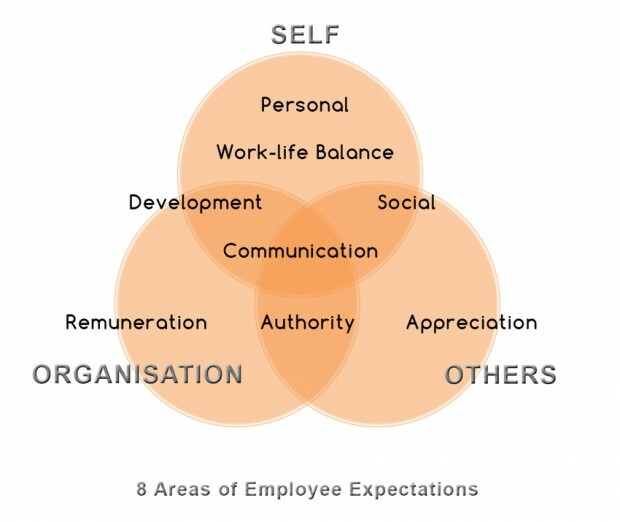 Working in large companies as an independent consultant I am intrigued to know what the values mean to the employees. If appropriate during a group session I will often ask who knows what they are and have learnt not to be surprised at the number of people who either don’t know or have them written down somewhere and have to retrieve them in order to answer the question. This is often despite the fact that they are written on large posters all over the building. So why does this happen? It’s simple – it’s about connection, meaning and expectation. I am going to use a simple model to explain what I mean. Gregory Bateson and latterly Robert Dilts came to the conclusion that we exist at different levels –as individuals, teams and organisations. At the very highest level we have a PURPOSE. 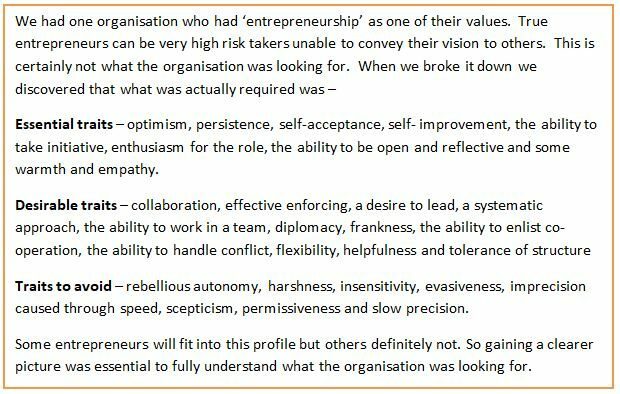 In organisations this is often put in terms of a mission statement or more fashionably as a simple a Purpose for the organisation. As individuals and teams we have a purpose, whether consciously or unconsciously, behind everything we do and want to achieve and, if stated clearly, this purpose will help to keep us on track. At the next level down we have IDENTITY/ROLE. In other words what role do we and others play in achieving the purpose. This is not so much about job title as the changing nature of the roles required of us in relation to each purpose eg, facilitator, coach, educator, entertainer, manager, designer, support, minder and so on. Now here comes the level of VALUES AND BELIEFS. What is important to us as an organization, team or individual? Companies spend time determining high level values as seen above and display them on their websites and walls. The expectation here is that employees will understand them, integrate them and live by them at work. CAPABILITY comes next. Do we have the capability to fulfill the purpose. What’s missing? If it’s important and we believe it’s possible then this level can be satisfied. Effective BEHAVIOUR is the result of all the above levels being aligned. This is the visible part of the process and the one that is often judged. Finally its behaviour, often unconscious once it becomes habitual, that determines the culture or the ENVIRONMENT of the organization – it’s the visible and kinaesthetic manifestation of all the levels of above. 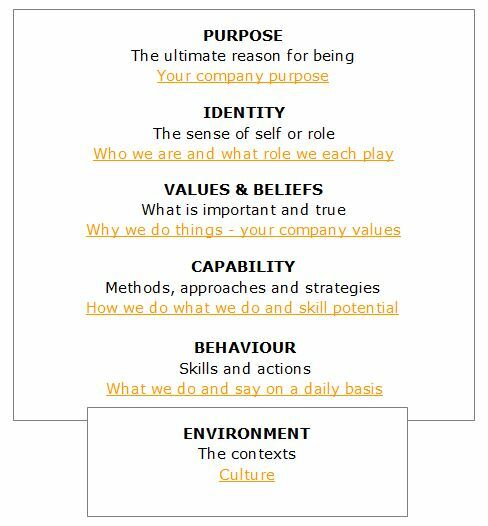 What happens in organisations in relation to values? Organisations are very good at coming up with a set of meaningful values. The question is meaningful for who, and how do we test for them at interview and beyond? How do they become part of the muscle of the organization? The trouble with values is that they are generally stated in high level, abstract language that is open to interpretation by individuals if indeed they get that far. Abstract words generally remain just that – abstract! Hence the inability often of people to relate to them, own them and live by them. Take collaboration for example. If you were to walk around an organization with this value what sort of behaviours would you see? Collaborating with who, when, about what? Does everyone have to collaborate or just a few people? What does collaboration look and feel like? How do I test for this at interview without asking a direct question about collaboration to which the interviewee is likely to have a prepared answer, particularly having read the values on the website beforehand? Collaboration is a working preference that not everyone is comfortable with. And what about humility? How would people demonstrating humility in the workplace be behaving? Or passion? Passion in organisations is often missing if research into job enjoyment is anything to go by. Passionate about what? How does it show? The reason for the disconnect is often because organisations stop when they get to the values level. The people who determined the values in the first place know what they mean to them and make the assumption that everyone else will know what they mean. They also, until now, had no way of measuring them effectively. More than 25 years ago Dr Dan Harrison began to conduct some research into what makes people perform well in the workplace. His research concluded that if people enjoy at least 75% of their work they will do it well and become more productive. He also utilized paradox theory in the design of his unique talent solution which has been developed and refined over the years to become one of the most effective talent solutions on the market today. Basically saying that assessments that utilize a bipolar measuring mechanism are missing the point that people can demonstrate a combination of two opposing traits – it’s not a question of either or it’s a combination of both which produce balanced versatility of behaviour. For example, being frank doesn’t mean that you are never diplomatic. You can have both traits. These two factors alone make Harrison Assessments one of the most effective business tools on the market today. It is this system which can determine the behaviours which sit behind the values and which can be measured by completion of an on-line SmartQuestionnaire™. Using the HATS system, organisations can create a template for the behavioural expectations of their employees. This template can then be utilized in recruitment, alongside similar job specific templates and can also be incorporated into the appraisal system if appropriate. This latter has the strong benefit of raising awareness of behavioural expectation as well as giving managers the confidence to ask questions in relation to such, normally subjective, aspects of performance. Such conscious awareness of expectations creates a culture that directly aligns with the values and purpose of the organisation. If you would like to know more about matching behaviours to values call 0800 689 3761.